It is always welcoming to have a great way to introduce IoT to the common folk. Smart (car manufacturer) pulled of a very interesting campaign in Lisbon, Portugal to provide a fun and safe way to prevent people from crossing the road on a red signal - which has been identified as a main source of road related accidents. The catch? 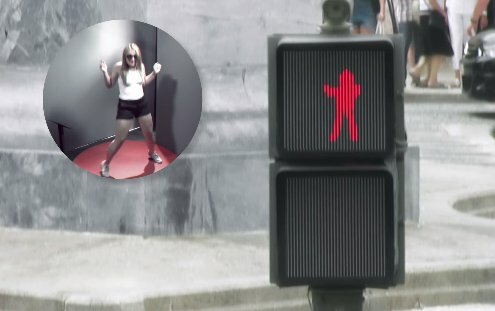 random pedestrians were invited into a box to dance and their actions were displayed on a few traffic lights in real time. The outline of the dancer was captured using a video camera and then digitized into what seems to be a 32x32 LED matrix showing the respective outline - complete with a video feed from the cameras to see the reactions of the public in real time. It was obvious the reactions from the audience caused some dancers to be a little creative in their moves. It would be interesting to know exactly how the team integrated such modifications; my guess would be the use of a series of high powered micro-controllers like the Raspberry Pi, networked together and connected to a LED matrix component to transmit the digital bitmap - they did post a making of video however didn't release details on the hardware. 81% more people stopped and waited for the green signal - at least until it gets boring.